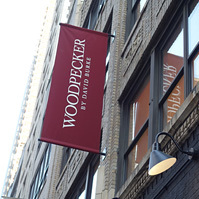 Woodpecker is chef David Burke's new wood-fired American restaurant in NoMad. The space features a full bar, private dining room and seating for more than 100 guests. The menu is a bit quirky, something Burke fans grown accustomed to. It includes an assortment of pizzas, including one with "crickets" and jalapeno pesto. There are Lobster Calzones complete with claws and antenna, and Pastrami Salmon served with an everything waffle. Wood-fired meats include Filet Mignon, Pork Prime Rib, Hay Smoked Lamb Chops and a patented 40-Day Saltage Prime Kansas City Strip weighing in at 20 ounces. Burke likes to have a bit of fun at his restaurants and Woodpecker fits that mold.